Sen. Krysten Sinema (D-Ariz.), who has a master’s degree, a law degree and a doctorate, is the first woman ever to represent Arizona in the Senate. 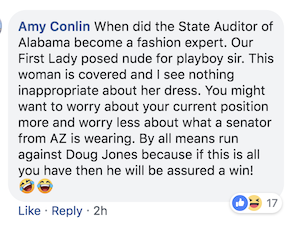 But Alabama State Auditor Jim Ziegler thinks people should pay attention to the clothes Sinema wears on the Senate floor, prompting others to ridicule her. defended Moore, citing the Bible says Mary was a teenager and Joseph was an adult. He posted a photo of Sinema on his public “Jim Ziegler State Auditor” page on Saturday and shared it to his personal Facebook page. Misogynistic Facebook commenters agreed with Ziegler. Senator Barbie Doll” and “Senator Madonna,” perhaps taking a nod from the leader of the Republican Party who used his global podium to troll women, even mocking #MeToo movement, during an appearance in Montana. Ziegler wasn’t the only one to try and shame Sinema for her clothing, though. Others, including women, took to Twitter to degrade her outfit worn on Thursday. Despite the government shutdown at the time, people decided to focus on Sinema’s work wardrobe.